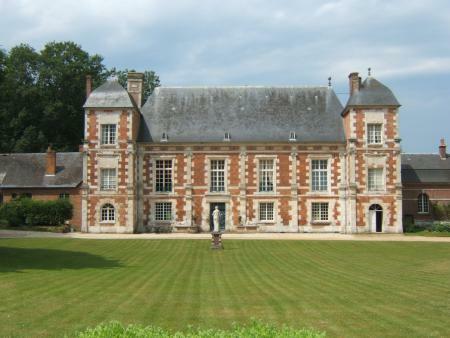 This highly-recommended Chateau is a one-of-a-kind B&B experience, where you live in a sumptuous castle setting in Versailles or Loire Valley style. 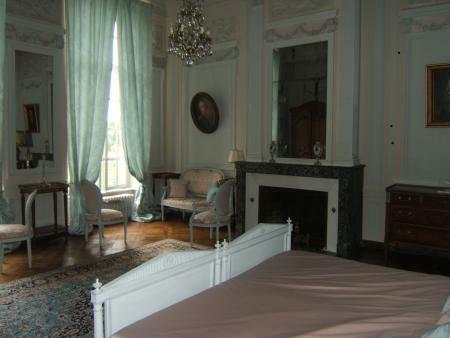 The two luxury suites at the Château de Bonnemare are among the most beautiful B&B venues of France. 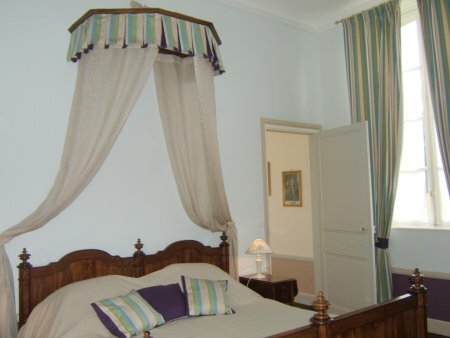 Chateau de Bonnemare also propose two bedrooms located on the ground-floor in a wing of the main castle. 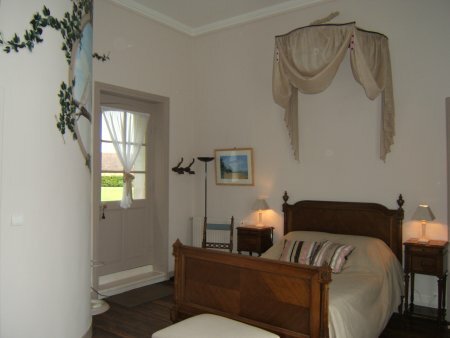 Bonnemare is nestled in a quiet country setting between Paris and Rouen, not far from Giverny and les Andelys. When you enter the estate through the Renaissance gate, you set foot in another world. In front of you, the harmonious façade of the manor, built in 1570. Bonnemare has been in the hands of the same family for 120 years now. Sylvie welcomes you with the natural ease of one who grew up in the castle and knows the story of each stone. Her home is her passion, and it is your special pleasure to discover it with her. In contrast to this bucolic world is the sophisticated delicacy and finesse of the château itself. The vast salon on the ground floor, stately as a ballroom, is at your disposal. Climbing up the monumental staircase you enter the fairytale world of two suites still decorated as in the 17th century. Consists of the Parade Bedroom, the Boudoir, and Bath. It was reserved for special guests, with its canopied four-poster bed prominently ensconced in an alcove set apart by a balustrade. The painted ceiling depicts Apollo and his chariot. A monumental fireplace of carved gilded wood faces the bed. Above, a majestic painting by Lionello Spada, Enea and Anchise, along with portraits of King Louis the 14th, the Queen of France and the Grand Dauphin. Advancing on a four-century parquet floor you enter the Boudoir, a vaulted room with delicate 17th century frescos adorning the walls. Above, the gods of Olympia, below, children at play painted in grisaille and trompe-l'oeil. 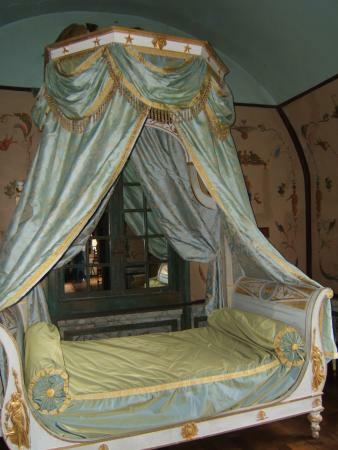 And a delightful canopied divan. 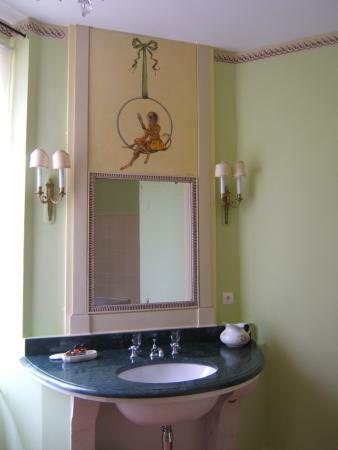 The Bath is a more recent creation decorated in the same spirit, in marble and Roman frescos, with modern bath, double basins and separate toilets. 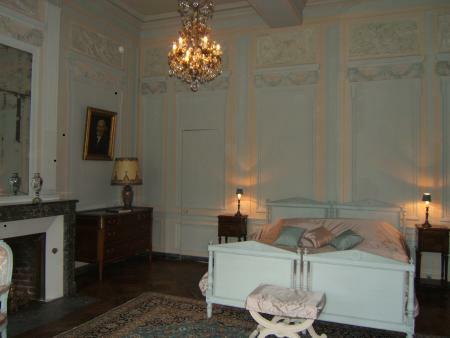 With the Yellow Sitting Room, the Louis the 16th Bedroom and Bath. 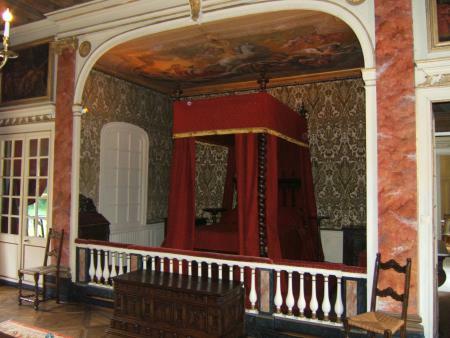 Instead of a boudoir, you have a sitting room for playing cards and music. 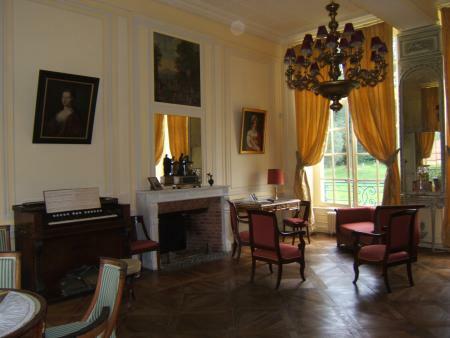 Comfortable chairs surround the fireplace and the gaming table, and you can treat your fingers to the grand piano and the harmonium that is said to have belonged to Berlioz. Windows on both sides open onto the park, with over 20 hectares enclosed by walls and hedges. Soft light, blue and pink hues, delicately carved flower garlands. 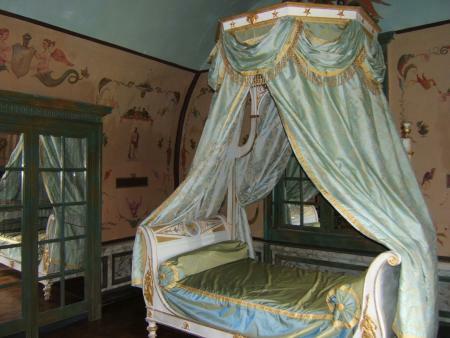 This exquisite bedroom was decorated in 1777 by Charles Leblond, the specialist working for Monsieur, Louis the 16th's brother, during Louis's reign. Stucco panels depicting scenes of noble human activities are bordered by pilasters. The characters portrayed seem about to step out of their frames. The double bed can be converted to two singles on request. 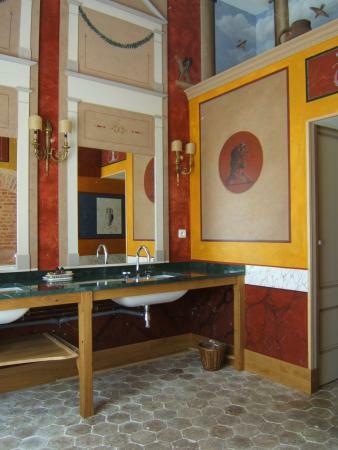 In this Bath, the fabrics and frescoes call up the taste of the Court for exotic animals. 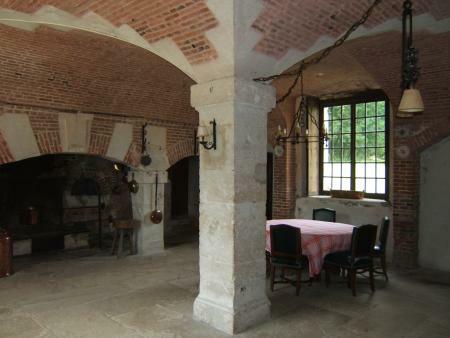 In the morning, you will discover what a true Renaissance castle kitchen looks like, a beautiful room with walls of pink brick and stone and a vaulted ceiling. The fireplace occupies an entire wall, used for boiling soup, roasting meats, baking cakes and smoking sausages. Ask the castle owner to explain the ingenious system, invented by Leonardo de Vinci, to drive the roasting spit. Then treat yourself to a breakfast of tasty products from the farm.